We did not go to the digging site today. Only a few staff members including Professor Yossi went to the site to take the aerial photos. There is a special company taking the aerial photos using drones. But the problem was that the Israel Air Force did not allow anything to fly in the air due to the current situation of war. So they failed to take the nice aerial photos. Instead, they took some photos using ladders. Most of us stayed in the Kedma Village and worked on bones and potteries. My job today was to write the identification number on the potteries. Though the writing looks big on the photo, it is actually very fine and small so that a few people cannot even read. 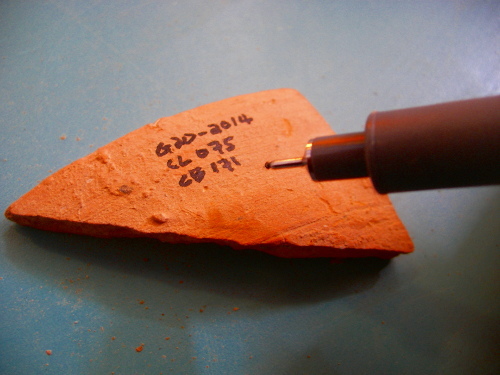 The first line is the excavation permit number indicating the site and the number. The first letter on second and third line (C) is area. The second line shows the locus number while the last line tells the bucket number. 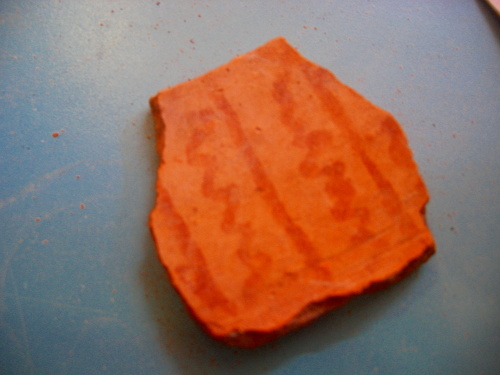 While I was writing the IDs on the potteries, I found this very nice piece of pottery with a pattern or painting on it. 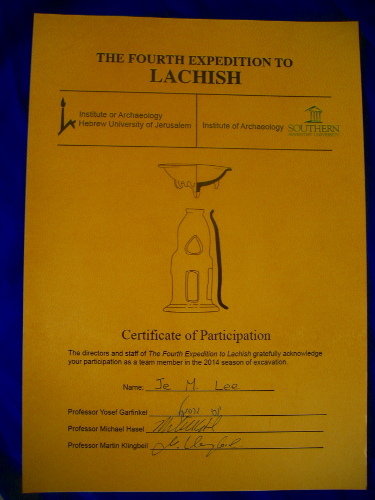 At lunch time, I got this certificate that I actually attended the Tel Lachish excavation. Professor Yossi and the photo team came back in the afternoon, and we all worked on the pottery reading. 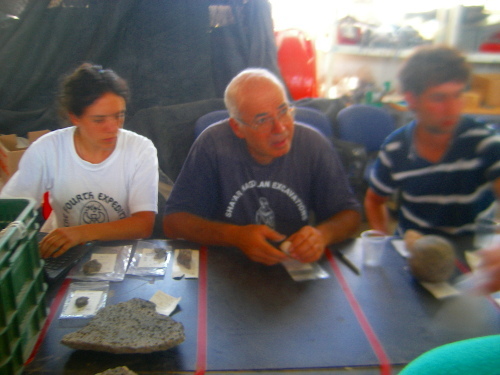 Professor Yossi explained many things on the archaeological potteries. Professor Yossi is sitting in the middle, and the guy one the right whose name is Igo is working on his Ph.D on archaeology at Hebrew University under Professor Yossi. This is an ancient knife for domestic use (not for war), probably for cooking and other use. It is probably from the bronze age. Why do people use stone in the bronze age? Bronze age does not mean people used only bronze, but they began to use bronze. When the radio came out, many people predicted that the newspaper would disappear. When TV came out, many people expected that the radio would disappear. When internet and web became popular, many scholars thought that all other media would disappear. But today, we have newspaper, radio, TV and internet all together. 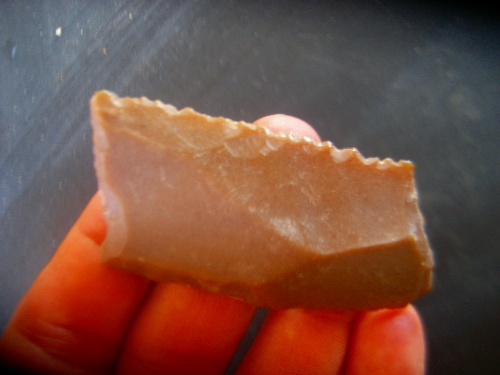 According to Professor Yossi, people stopped using stone knife or flint only after iron tool became common and popular. We had pizza party at Kedma. And they will have official finish-up party on Wednesday which I cannot attend because I will be digging at Megiddo. I was told that the next Wednesday is Professor Yossi’s birthday. Happy birthday Yossi! I am using MTS home phone and internet. MTS internet is a kind of DSL (probably ADSL) which is connected to and use phone jack and line. One week before my moving day, I called MTS that I would move into new place. In the morning (probably 9am) of my movign day, first of August, I picked up the phone but I did not hear the tone sound which means my phone line is not working and they already moved the service to my new place. And I turned on my laptop to find the internet was working well. I found that xDSL uses phone line but has nothing to do with the phone service itself. If the physical phone line is alright, the xDSL works. This finding is quite interesting to me because I thought the two services are connected each other. MTS 전화와 인터넷을 사용하는데, 인터넷은 DSL 종류로 (아마 ADSL인 듯) 전화 잭과 선에 연결되어 있다. 이사하기 일주일 전에, MTS에 전화를 걸어 이사 신고를 했다 (MTS 전화번호는 2255-687로 이를 전화기 숫자에 써 있는 알파벳으로 바꾸면 CALL-MTS가 되어 굉장히 외우기 쉽다). 드뎌 이사하는 날 아침 9시. 전화를 하려고 수화기를 집었는데, 신호음이 없다. -_-;; 벌써 전화 서비스를 새 아파트로 옮긴 모양이다. 아뭏든 전화는 작동하지 않았다. 그리고 노트북을 켰는데, 인터넷이 잘 된다. O.o DSL 은 전화선을 사용하지만 전화 서비스 자체와는 관계가 없단 걸 새로 알았다. 물리적인 전화선 자체가 문제 없다면, DSL은 작동을 한다. 이번 발견은 꽤 흥미롭다. 여지껏 난 두 서비스가 상관이 있다고 생각했었다.